A man named Sid Bernstein kept hearing about a huge Rock & Roll band in England called the Beatles. He finally met a Brian Epstein (the Beatles manager) contact & booked the Beatles to play Carnegie Hall on Lincolns birthday 1964, almost a year away. 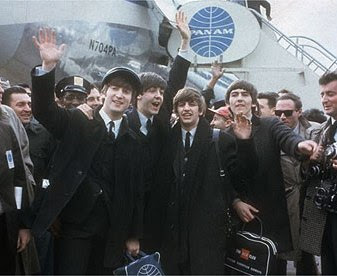 As the legend goes the Beatles didn't want to come to America until they hit Number One. But Epstein jumped at the chance to get the Beatles to play in New York, especially since they hadn't even charted yet in America. All fell into place as Epstein got the Ed Sullivan show booked as well. 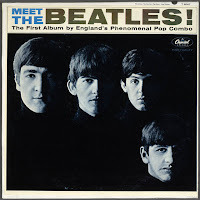 "Introducing the Beatles" & "Meet the Beatles" LPs were released in January 1964 and with a great 'The Beatles Are Coming!! promotion, the hype began to build. As fate would have it " I Want To Hold Your Hand" hit number One by February 1964. 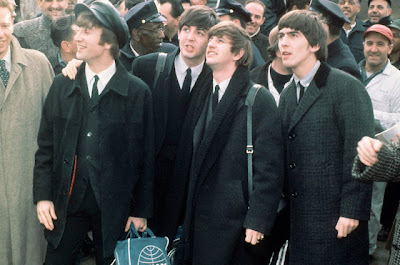 On February 7th 1964 the Beatles left England not knowing what would happen when they arrived in America. 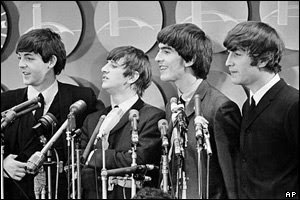 As it worked out almost according to plan, they had the number one song in America "I Want to Hold Your Hand" and two other huge hits "Please Please Me" & "She Loves You" climbing up the charts. By the time they landed at JFK airport it was a total madhouse. Every transistor radio station in New York was playing Beatles songs, counting down the moments of their arrival. It was "thirty eight Beatle degrees". "Eight thirty Beatle time" all over the airwaves. Recorded Beatles responses to generic questions were played over & over. The hype was incredible. No one had seen the likes of any kind of freak show like this. Remember in 1964 the Beatles had the longest hair on the planet, their tailored suits were total English mod fashion, nothing like what was happening in America. These guys were playing a new kind of Beat music that made Rock & Roll of its time sound tame. Previously a pop star would front a group with four back up guys behind him, and some one behind the scenes calling the shots. The Beatles were four individuals with their own opinions, very witty & full of humor. They drank, smoke, & swore. They were confident, wrote their own music & played their own instruments. 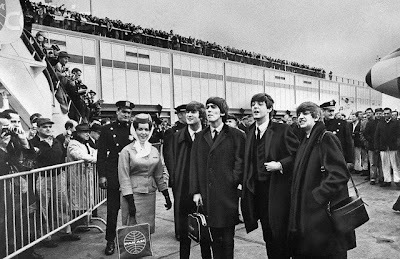 Thousands of fans had gathered at JFK airport cutting school to greet their new heroes. NYPD had 110 of its finest in preparation of the arrival. One official stated "We've never seen anything like this, not for kings, presidents or anyone". The Pan Am jet landed on American soil to a roar of 4000 plus screaming fans. The boys were whisked through customs then put into a press room to face the older press, ready to devour them. But quickly the Beatles won over the press with their humor & charm. What Do You hope to take home with you from America? "Rockfeller Center." How Do you find America -"Turn left at Greenland"
What Do You Call Your haircut? 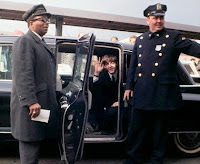 "Arthur"
After the airport the Beatles motorcade proceeded into Manhattan & began their stay at Central Park Souths Plaza Hotel. They were booked a few months prior under their real names as English businessman. 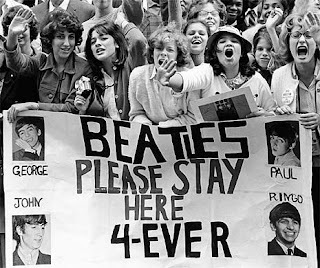 The Plaza was under siege as thousands gathered on the streets outside screaming, singing and holding up signs of their favorite Beatle. Mounted Police were were quickly dispatched to take over crowd control, it was utter chaos. In their suites Brian Epstein conducted business with his small staff. The Beatles did radio interviews by telephone to America & London radio stations. 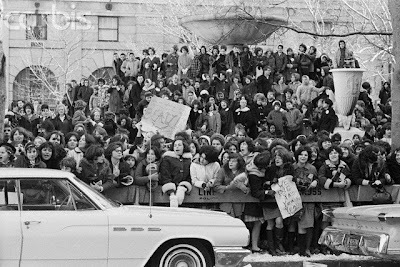 New York City went wild in what was to become Beatlemania. Everyone jumped on the band wagon. Woolworths was selling the "Meet The Beatles" album for $3.98. The stores became flooded in what was the first huge Rock & Roll marketing campaign. Everything from Beatle wigs to trading cards, talcum powder, to candy, to dolls were sold. Many unauthorized rip off items also flooded the market at first until they were rounded up & removed.